Every year, social media becomes more important as a tool for schools to attract new students. Prospective students don’t just read catalogs and tour campuses anymore—they also follow their favorite universities on Facebook, Twitter, and other social media sites. Last year, the staff here at MPHProgramsList.com published a list of the 25 most social media friendly schools for 2012. Since then, we have had time to reevaluate and improve our formula, tweaking it to give more weight proportionately to the social media platforms that are used most frequently by public health schools. 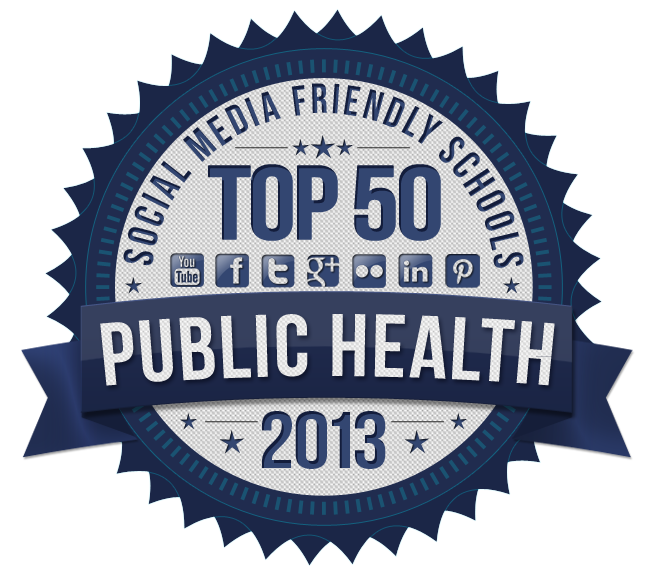 This time we evaluated 61 public health schools to find the 50 most social media friendly schools for 2013. There were 100 points possible, with 24 for Facebook, 20 for Twitter, 18 for LinkedIn, 15 for YouTube, 11 for Flickr, 6 for Pinterest, and 6 for Google Plus. We decided to include 50 vs 25 this year to subtly nudge the lower ranked schools to get busy. If your school is one of the top 50 schools, feel free to post the badge on your school website and social media profiles—and tell the world about your accomplishment. After all, you worked hard to earn it. Social media is here to stay! Once again, Harvard School of Public Health came out on top. The school’s mission is to advance public health by providing the best public health education, fostering new discoveries in public health, and increasing the public’s awareness of health issues. At the Gillings School of Global Health, public health is treated as a diverse area of study that spans multiple disciplines. The Gillings School is committed to maintaining high standards of excellence and adhering to a strong code of values and ethics. The Bloomberg School of Public Health helped eradicate smallpox and is now working to wipe out malaria. The school played a role in reducing the spread of HIV and exposing the health problems associated with cigarette smoke. The University of Michigan School of Public Health is tracking emerging diseases, finding ways to motivate people to change risky behavior, and partnering with communities to help them solve their own health problems. At the Boston University School of Public Health, there are eight public health concentrations available at the master’s and doctoral level: biostatistics; environmental health; epidemiology; health law, bioethics and human rights; health policy and management; international health; maternal and child health; and social and behavioral sciences. As a major recipient of NIH grants, Mailman is able to conduct research and service projects in over 100 countries and is committed to helping underserved populations all over the world get the healthcare they need. The University of Washington School of Public Health’s strategic plan for 2012-2020 encompasses seven goals, including improvement of teaching and research methods, globalization of the school, diversification of the student body, and strengthening relationships with community partners. With around 400 students and mentors involved, the University of Minnesota School of Public Health’s mentorship program is the largest in any public health school. Mentorship relationships are often long-lasting and enrich mentors and mentees alike. OSU’s College of Public Health is the only public health college in Ohio. In cooperation with Columbus Public Health, the college holds a farmers’ market during the summer to provide farm-fresh fruits and vegetables to area residents. The UCLA Fielding School of Public Health has five departments: biostatistics, community health sciences, environmental health sciences, epidemiology, and health policy and management. The school also has two interdepartmental programs: environmental science and engineering, and molecular toxicology. In addition to its on-campus programs, Loma Linda University School of Public Health offers the following online programs: PB Certificate in Lifestyle Intervention (online only), MPH Health Education, DrPH Health Education, and MPH Population Medicine. The University of Wisconsin-Madison is a top research institute with campuses throughout Wisconsin. The school is in the process of integrating its public health and medical schools into a single School of Medicine and Public Health. Drexel’s School of Public Health offers hands-on learning experiences along with a rigorous academic program that provides a comprehensive understanding of biostatistics, community health and prevention, environmental and occupational health, epidemiology, and health management and policy. The Yale School of Public Health’s research program is helping to solve health problems that affect populations around the world. Study subjects include AIDS, cancer, environmental pollution, chronic and infectious diseases, and health policy. The Colorado School of Public Health is a collaboration between Colorado State University, the University of Colorado, and the University of Northern Colorado. The MPH program offers seven areas of study and two dual degrees. SLU’s new College for Public Health & Social Justice combines several SLU programs to form the only accredited Catholic Jesuit public health school in the country. The faculty is recognized for excellence in teaching, research, and community service. Tulane’s School of Public Health and Tropical Medicine is the oldest school of tropical medicine in the U.S. and the only combined school of public health and tropical medicine in America. The school has over 1,400 students from all over the world. The OSU College of Public Health and Human Sciences offers programs in athletic training, biostatistics, environmental and occupational health and safety, epidemiology, exercise and sport science, health management and policy, health promotion and health behavior, human development and family sciences/studies, international health, nutrition, and public health. The UAB School of Public Health values open and honest communications, positive behavior, teamwork, respect, integrity, and diversity. The school strives for excellence in all areas and seeks to make a difference in the community. The University of Maryland School of Public Health has six academic departments: behavioral and community health, epidemiology and biostatistics, family science, the Health Services Administration, kinesiology, and the Maryland Institute for Applied Environmental Health. In addition to the main campus in Houston, the University of Texas School of Public Health has five campuses throughout Texas, located in Austin, Brownsville, Dallas, El Paso, and San Antonio. Each campus has its own faculty and specializes in different fields of research. The GWU School of Public Health and Health Services is dedicated to training leaders in the public health field, creating innovative educational opportunities, fostering an environment of empowerment, encouraging multidisciplinary collaboration, and developing science-based policies and programs. WVU School of Public Health faculty members perform research at externally funded centers, including the Center on Aging, the Institute for Occupational and Environmental Health, the Translational Tobacco Reduction Research Program, and the WVU Biostatistics Consulting Group. The University of Pittsburgh Graduate School of Public Health has seven departments: behavioral and community health sciences, biostatistics, environmental and occupational health, epidemiology, health policy and management, human genetics, and infectious diseases and microbiology. The University of Illinois at Chicago School of Public Health is proud of its many achievements, including preventing the spread of HIV in Africa, curbing shootings and violence in Chicago, and bringing clean water to families in South America. If your school didn’t make the list this year, take a look at your social media stats to see where your effort might be lacking. Do you have accounts at each of the seven platforms we evaluated? Are you regularly posting on each of your accounts? Are your posts interesting? Do you take time to interact with your followers? These are a few things that can help you get a better response from your social media activity, as well as raise your scores for next year’s list. Note: Please let us know if you see that we’ve made a mistake so we can fix it. Thanks!